Pre-Serve-It! Can Some Jam! 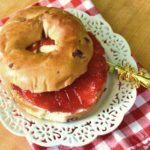 The old-fashion traditional practice of home canning is making a come-back and starting with jam is an easy way to step into this preserving craft. The recipe we are sharing is the Cranberry Apple Jam. Autumns two favorite flavor twins, ground cinnamon and nutmeg, spice the well balanced tartness of the cranberries and sweetness of the golden delicious apples. This jam is the perfect spread on toast, bagels, pancakes, even a glaze for your Thanksgiving turkey. Preserving jam can be made anytime of the year since frozen and fresh fruits can be picked up at your local fresh market, but to capture the vine ripe flavor it is best to can in the month the fruit ripens. Canning jam makes a perfect gift and will give you a great sense of accomplishment as well as preserve an American tradition. So what are you waiting for? Got Jars… Got Fruit… Got Recipe? Pre-serve it and can some jam. Prepare fruit. Peel, core and dice to ½” apples. Rinse and sort cranberries, remove damaged or dried berries. Combine the apples, cranberries, sugar and water in a large pot (use a big one, this jam will bubble) over medium high heat. Bring to a boil, skimming off the foam that develops on the top of the fruit. Cook for 10-15 minutes, until the cranberries pop and the apples soften. Add the lemon zest, juice and simmer until the liquid in the pot begins to thicken (apples and cranberries are naturally high in pectin you won’t need to add liquid pectin to set this jam. Just continue to cook jam until thick and syrup-y). If you like smoother jam, emulsify or mash mixture. I used a hand stick emulsifier. If you like chunky fruit keep as is. Spoon hot jam into prepared jars, leave ½ “ space at top of jar, wipe inside and around top edges of jar with damp paper towel, attach warm lid and bands. Process in a boiling water canner for 15 minutes. Start timing after water comes to a boil. Great for gift giving. Serve this jam as a glaze for ham or turkey, a jam for sandwiches, cream cheese block, ice cream topping or pancake syrup. To serve as a glaze or syrup topping, microwave ½ -cup of jam in microwaveable bowl 30 seconds until melted. Stir until smooth. Inspect all jars, lids, & bands for cracks, nicks, debris from past usage. In large canner or stockpot, fill with water three-fourths full. Set jars without lids or bands in pot submerge to sit flat in canning rack. Water level should cover the jars at least 2 inches of the top. Cover with lid and bring to a boil over high heat. Reduce heat to medium to keep jars warm until ready to fill. In small saucepan, fill with water and heat on medium but not boil. Remove from heat and add lids only and keep warm until ready to use. Read Cranberry-Apple Jam recipe- gather ingredients, measure sugar, spices and prepare berries- apples. Rinse & inspect berries, remove discolored ones, peel apples and dice. Fill Dutch oven with cranberries, apples, sugar, and water. Stir constantly with wooden spoon over medium-high heat until berries pop and mixture thickens. If you like smooth jam, you will need to emulsify or strain mixture through a sieve. Using stick emulsifier process mixture in Dutch oven until desired smoothness. Add spices and lemon juice and cook until desired thickness, stirring constantly. Turn up the heat on the canner with jars to bring to a boil once again. After boiling for 5 minutes, use jar lifter and remove hot jars from water canning bath. Drain jars and place on clean kitchen towel upright. With wide mouth funnel resting on top of jar, spoon the hot fruit mixture to the hot jars, filling to within a half inch of rim. Carefully tap jar on towel to settle fruit mixture. Working quickly,wipe rims of jars with clean damp paper towel. If you skip this part, you may not get your lids to seal during processing. Top jars with warmed lids and rings. Tighten lids just until closed. Do not screw on the lids super tight, just so the lid catches. Place canning rack in stockpot or canner. Using jar lifter, transfer filled jars into rack and lower into rack and boiling water. Bring water back to a rolling boil cover and process for 15 minutes. Make sure the water level is 2” above the jar lids. Add hot water if necessary, increase boil time 5 additional minutes to ensure proper processing time. Using the jar lifter, carefully remove jars from canner and place on clean kitchen towel. Allow jars cool at room temperature for 24 hours. You should hear a popping sound as the jars begin to cool. If the lids when pushed in the middle bounce, you did not get a good seal and will have to replace the lid with a new one and reprocess for 15 minutes. You can store jam in refrigerator if you do not want to reprocess. Label and date the jars, store sealed jars without the bands in a cool dry place up to 1 year. Store opened jars and any unsealed jars in the refrigerator up to 2 weeks. Liz Bushong is an expert in the three-dimensional art of entertaining. She transforms simple dining occasions into beautiful and memorable moments by adding a touch of her own “sassy style”. For the past several years Liz has been entrusted to decorate several high profile homes for the Holidays including the White House, Vice Presidential Personal Residence, Governors mansions and more. She is a featured monthly guest chef/designer on regional CBS/ABC Affiliates Daytime Tri-Cities, Daytime Blue-Ridge Roanoke and other television shows. Liz is the author of Just Desserts and Sweets & Savories cookbook as well as writer for several magazines including VIP SEEN & Lovely Bella.